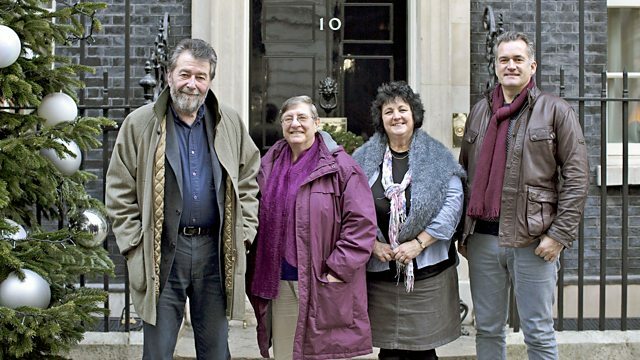 Eric Robson chairs a special, festive edition recorded inside Number 10 Downing Street, including an exclusive interview with head gardener Paul Schooling. A video marking the special, festive edition of the programme. Why did Margaret Thatcher tell off Number 10's Head Gardener? Head Gardener Paul Schooling shares the story of being told off by Margaret Thatcher. Facts about the history and the building behind the world's most famous front door. Follow us into the magnificent rooms of the headquarters of Her Majesty's Government. Q – Advice on growing cauliflowers please. Christine – I was taught to use a sledgehammer to firm the soil up! Q – I’d like to plant a holly bush that will give red berries at this time of year. Please can you recommend a variety? And do I need a male and a female? Christine – Ilex ‘JC van Toll’. Self-fertile and reliable. Don’t let it dry out. Pippa – Watch out with the misleading names – ‘Milkmaid’ is a male, and ‘Golden King’ is female. Q – Is it good or bad to mulch trees with grass clippings? Pippa – I wouldn’t mulch with pure grass clippings. I would mix with something drier to keep it aerated. Never go right up to the trunk of a tree or shrub. Q – My spring bulbs have already started coming up. What should I do to protect them over winter? Q – What’s wrong with the roses growing in our garden? Matthew – This is the ideal time to replace them. Make a new bed, feed it well with lots of organic matter, with lots of sun and good air circulation. Then plant in good new rose stock. Q – Which Dogwoods are the panel’s favourite? Matthew – I like flowering Dogwoods. Flowering Dogwoods (Cornus kousa) like woodland conditions. Stem-coloured Dogwoods would be a bit easier for you, from the lime green ‘Flaviramea’ through to the purple Cornus kesselringii. The key is to be very generous with numbers. The classic red Cornus alba ‘Sibirica’ with the ‘Flaviramea’ behind it, in big numbers looks great. Q – I’m looking for perennial plants for our rowing club grounds that will flower together in early June in our club colours of red, light blue and dark blue. Q – I need to change the plants in my strawberry bed? What variety would be best for large, flavoursome fruits? Christine – ‘Christine’ is the best variety – plump, juicy, and very tasty! Ideally don’t plant strawberries back into the same bed. Pippa – Get a wide range of varieties – there’s a big fruiting one called ‘Marshmello’ and the classic ‘Cambridge Favourite’ has great flavour. Q – Can you recommend therapeutic plants for the garden of a busy politician? Christine – Mint for a nice cup of mint tea. Camomile and sage too. Matthew – Aspidistra. Agave americana.